I got to do a quickie trip to NYC at the beginning of Fall. My hubby had a conference... and I went to play. I was under the weather at the time but couldn't bear to miss the chance to check in with my favorite city after an unbelievably long dry spell. The rain pummeled me the entire day and it crossed my mind to hunker down in a museum instead. But I hadn't traded seaside for city to spend any signifiant amount of time not physically on the streets. So I walked it out, at times that first day hovering near enough to our hotel by Grand Central in case of collapse. Good time to load up on kid souvenirs. Dinner that night was at one of my old haunts, Lucky Strike. (Hmmm... much louder than I remembered.) Drinks and dessert followed at a new-to-me fab spot, The Dutch. Later, we strolled the Village and I felt my under-the-weather bug suddenly being replaced with the city-that-never-sleeps bug. I now wanted to stay out all night. But peeps had to work the next day, so that bug was readily replaced with the reality bug -- that we are simply no longer sleep-deprivable. Day 2 -- Had Eggs Florentine near the hotel then headed immediately downtown. 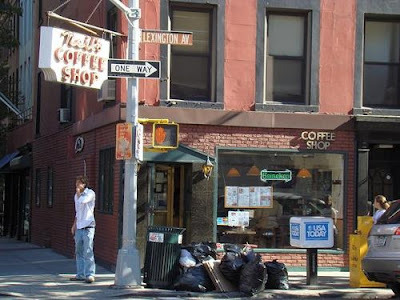 First stop, a coffee from Dean & DeLuca, then some good, solid, familiar hoofing in the West Village, Soho, and Nolita. I lit up seeing some of my old fave storefronts. Dinner that night was at never-been-to Fig & Olive in the Meat Packing District. Succinctly put -- wasn't my thing. I couldn't help wishing that we were at Pastis around the corner instead. A little strolling followed, then one of the best cups of coffee ever, served with clotted cream, at Cafe Minerva back in the Village. Disappointing dinner officially made up for. Day 3 -- Last day. It'd be a half work day for my hubby so the plan was to meet for a final lunch together before heading to the airport. Loose idea -- to convene at (now possessing my mind) Pastis downtown. But things would ultimately depend on what part of the city I might be found in when he finished up. When he checked in with me, I was somehow uptown again instead of the intended down. (I hadn't tried the frozen custard at Shake Shack yet and hold Nora Ephron and her extols of it completely responsible for that detour.) Regardless, I hadn't been to the park yet either, so I was now in the midst of making my way through it from Upper West to Upper East. I got to touch base with lovely Bethesda Fountain... never quite making it to beloved Poet's Walk. There would be no time now to get downtown for our lunch and still pack up and make the airport, so we revised the plan to meet where I popped out of the park and grab a bite on the Upper East Side. After a lovely stroll down Lex and a quick dart into the Whitney, it was time to land on somewhere to eat. This wasn't my old hood, places weren't jumping to mind, and for whatever reason, we weren't stumbling onto the right spot either. It was starting to rain again, our NYC time was ticking away, and we were aimless. I told my husband that I recognized her and that we should follow her, she'll know where to go, undoubtedly somewhere fabulous and chic. We tailed her for a block and a half, passing a few upscale restaurants along the way, and then we saw her turn into a place. When we got closer, we could see what it was. A little diner on a corner. Called Neil's. Staying the course, we followed in not far behind and grabbed a table at the window. She was already sitting at the counter, chatting, as would a regular. After glancing the menu, we placed our orders, me inexplicably ordering French toast. Well, maybe not so inexplicably. New York French toast usually involves densely, saturated challah bread. It wasn't long before I spotted the server bringing lunch to our accomplice. 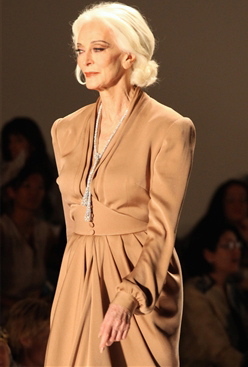 Naturally, I was curious what a flawlessly aging, oldest working supermodel would order for lunch. I was sure that the secret to aging without aging -- and quite possibly the whole fountain of youth -- was about to be revealed to me. Folks, here it is -- a buttery patty melt... and a cold beer! My own lunch fell a little flat -- the french toast was really dry (sorry, Neil). But the rain was pattering, people were streaming by our window in both directions, there was the smell of bus exhaust and lots of city noise. Hmmm... exactly as I remembered. I-was-in-heaven.